3d Physical Model with printed surface. 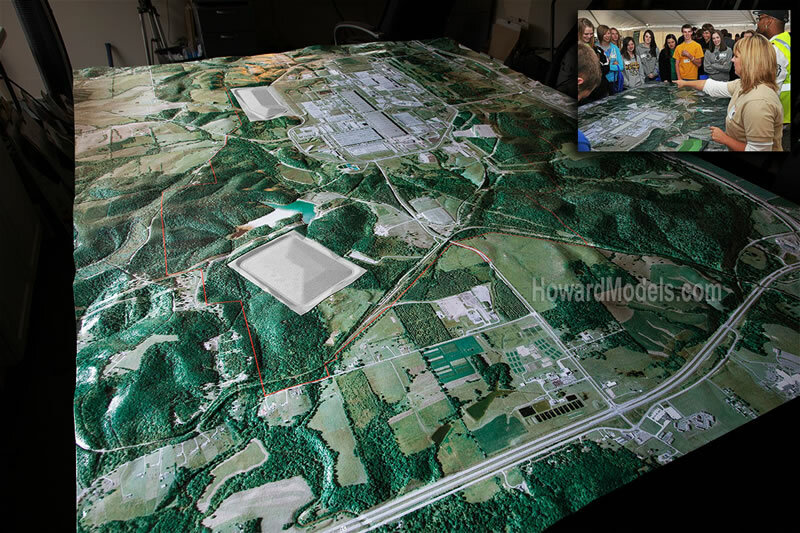 This printed terrain table model is of the Portsmouth Gaseous Diffusion Plant property located in Piketon Ohio. The facility previously produced enriched uranium, including weapons-grade uranium, for the United States Atomic Energy program and U.S. nuclear weapons program. When first opperational, it used as much electricity as New York City. The plant ceased opperation in 2001 leaving 10,000,00 million square feet of building space. Where does one put the rubble from the decontaminated and decommissioned buildings? This terrain table model is used to communicate to the local communities proposed solutions to the problem. An onsite landfill. 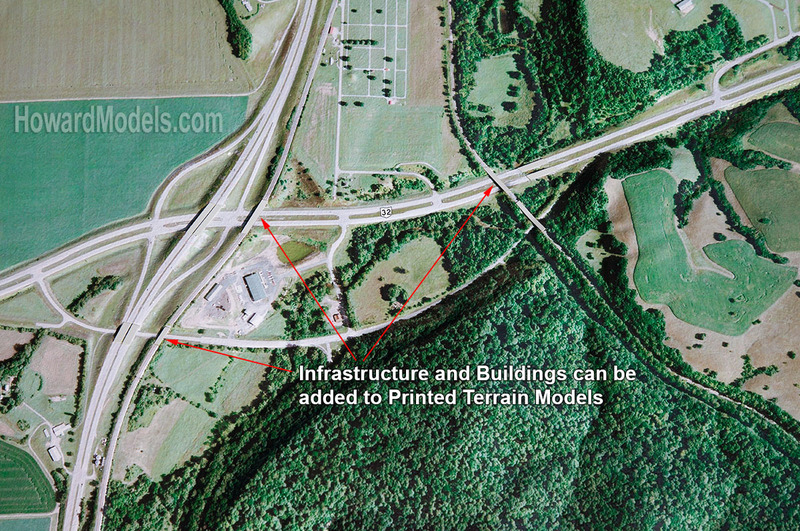 This model built in 2012 indicates two potential locations. As this is being written, (May 2013) the terrain table is scheduled to return for an update. We will be updating the shape of the landfill at the final location and disappearing the other. This terrain table had befor and after inserts for both locations plus geologic strata indicated on the section line splitting the site. Bridges and the main buildings were modeled seperately from the printed surface terrain table model. Most of our terrain model foam bases are ready to ship in 2 week or less. These raw foam terrain models are the ideal base for both study models and finished presentation models. The model looks wonderful. We had it on display at a meeting last night. It got a lot of praise and was very helpful. Thanks!